Volvo’s smallest ever SUV is finally here. After a painfully long teaser campaign, Volvo has finally lifted the wraps off its new compact SUV, the XC40, at a reveal event hosted in Milan. Sitting below the XC60 and XC90, the XC40 is Volvo’s smallest ever SUV and will be competing in the premium compact SUV segment established by the likes of the Range Rover Evoque and Jaguar E-Pace. As we already saw from Volvo’s last teaser, the XC40's echoes the 40.1 Concept, as well as its bigger XC60 and XC90 brothers, but slimmed down to look sleek and stylish and appeal to younger buyers. The customization options are comprehensive, with an extensive range of body colors and color-contrast roof options providing up to 17 combinations. Volvo’s signature Thor’s hammer daytime running lights compliment a redesigned grille to create a “strong, structured profile for a youthful expression,” along with large 18-inch alloy wheels and a 8.3” ride height. As you’d expect, the Volvo XC40 features the same sophisticated driver assist technology as its larger siblings, making it one of the safest and most well equipped premium CUVs on the market. Not that we expected the smaller SUV to skimp on safety features – this is a Volvo, after all. This means you get the brand’s semi-autonomous Pilot Assist, City Safety, Run-off Road protection and mitigation, as well as a Cross Traffic alert with brake support. There’s also a 360 degree to help you maneuver the car into tight parking spaces. Volvo claims that the XC40 offers a “radically new approach to storage” inside the car. Smart interior design provides more functional storage space in the doors and under the seats, along with a fold-out hook for small bags and a removable waste bin in the tunnel console. There’s even a special space for smartphones which features inductive charging, that can be connected to the infotainment through Android Auto and Apple CarPlay. Speaking of which, the 12.3 inch thin-film transistor instrument display and portrait 9-inch touchscreen in the center of the dashboard has been carried over from the XC60 and XC90. 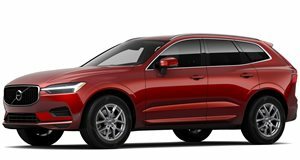 Meeting the demands for young professionals, the XC40 can be purchased using the automaker's new online “Care by Volvo” service in addition to traditional purchase and lease options. It works like a monthly subscription service, where a single monthly payment will cover everything from maintenance and insurance, to wear and tear items and protection services. Order books for the initial range-topping, all-wheel drive T5 model in Momentum trim are already open, with production scheduled to start in November. The XC40 T5 model is powered by a turbocharged 2.0-liter four-cylinder engine producing 247-horsepower, with prices starting at $35,200. A T4 front wheel drive model will be introduced next summer starting at $33,200.